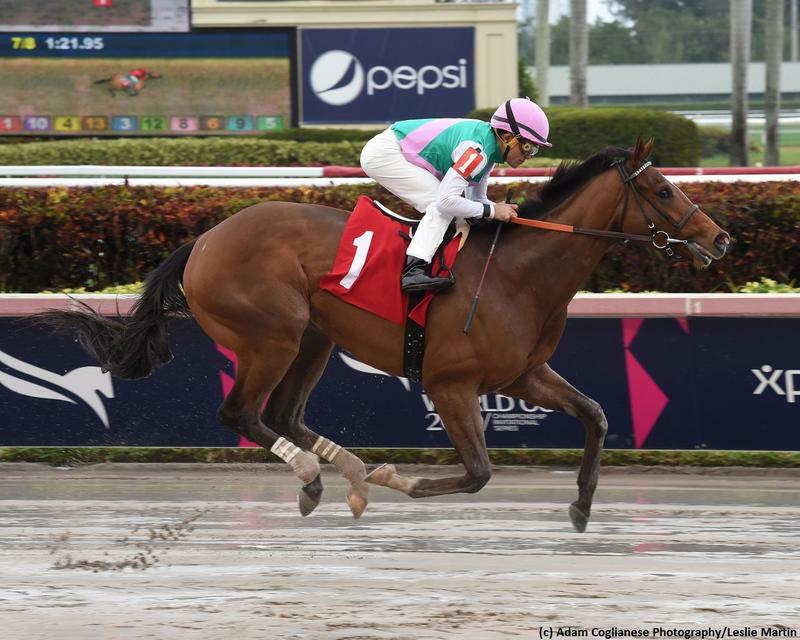 A field of 11 will contest the $1 million Florida Derby (G1) at Gulfstream Park on Saturday. The Road to the Kentucky Derby event has major implications for Derby hopefuls with a 100-40-20-10 points structure to the top-four finishers. I tabbed Hidden Scroll to win the Fountain of Youth Stakes (G2) with Bourbon War as the runner-up. While I was only half correct in that prognostication, I came away impressed enough with each of those three-year-olds to make the same prediction in the Florida Derby. The Bill Mott-trained Hidden Scroll was a brilliant 14-length debut winner at Gulfstream prior to the Fountain of Youth, where he went postward as the 6-5 favorite. The son of Hard Spun led to midstretch in his stakes debut before tiring late, though he was only beaten by three lengths after setting very demanding early fractions. He lands in a field with less early pace on Saturday and he was also assigned the rail, the same post that he broke from in his sterling debut tally. I love that the top prospect got a two-turn race under his belt and that he has trained forwardly in the interim. Javier Castellano picks up the mount atop the Juddmonte homebred for the first time and he could control things from the opening bell. A wire-to-wire victory is expected from the budding star. Bourbon War has been on my radar since his debut tally at Aqueduct as a juvenile. Trained by Mark Hennig, the well-bred colt was full of run late in the Fountain of Youth where he was a bit unlucky in defeat. It’s worth noting that he galloped out well clear of his foes after the wire. The son of Tapit should thrive with the extra distance on Saturday in his third assignment of 2019. Bourbon War was also flattered when Cutting Humor took the Sunland Derby (G3) on Sunday after easily defeating that colt in an allowance race here two races prior. I see Hidden Scroll running his pace foes off of their respective feet early with Bourbon War closing best of all behind him. The Florida Derby exacta is the Best Bet of the Weekend.